Along with the power of the coordinator role, comes the responsibility for creating the workspace(s) and organizing the documents. Depending on your corporate philosophy, you may or may not wish to start by involving the users in a ‘needs analysis’. I believe that such surveys get the users involved, which ultimately makes the workspaces more effective and efficient. One of the benefits of SharePoint Portal Server is to embrace the modern document centric view rather than the old application centric view. In practical terms this means creating a document folder called, say ‘Project X’ and then adding Documents from Word , Spreadsheets from Excel, Pictures from Paint Shop Pro, all in the same folder. Enhanced folders mean that you can publish, check-in and check-out documents. If you wish to use the approval process then make sure create an enhanced folders. None of these extra attributes are present in standard folders. Profiles thrive on metadata. Metadata is data about data. Profiles are an extension of the properties that no-one seems to fill in on word documents. What SharePoint does is force everyone to be more aware of these properties. 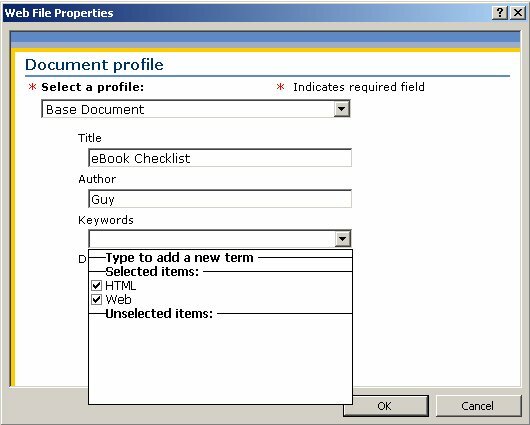 Furthermore, as coordinator you can force Authors to fill in metadata by presenting the properties menu when ever they create or amend the document. I expect that you have already appreciated the benefits of collecting this data – more power to search documents. Better information for the search engine, means a greater chance of a user with only scanty information, finding the very document they must have. The bottom line is more efficient document system so the material gets used. Another mechanism to help you find just the document you need. Use the Web Folder View to rename, create and organize your categories. Documents are not restricted to just one category. Also categories can contain documents from a variety of folders making this a powerful and flexible aid to searching.